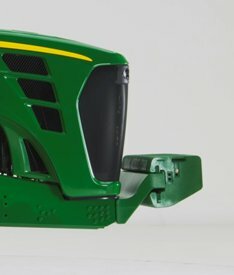 on new John Deere 9R/9RT/9RX Series 4WD and Track Tractors (excluding Scraper Tractors). Hitch/coupler allows for quick, no-hassle hookups to many popular integral implements. Tubular and box-welded steel construction. Heat-treated bushings to prevent cracking and breakage. Heat-treated hooks for long wear life. 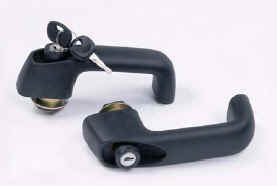 Locking handles that rotate 100 degrees to open the locking lugs for easy implement release. Hardened and zinc-plated steel alloy pins to take the shock of heavy loads and withstand exposure to the elements. A Category 5 to Category 4 drawbar conversion kit is available for operators who have Category 4 implements that cannot be converted to Category 5. The preferred method when operating high-horsepower tractors is to convert implements to Category 5. For additional implement information, please reference the planting and seeding or the tillage information. NOTE: Drawbar not included in kit. A ball-type drawbar is used when pulling the DN345 Drawn Dry Spreader. 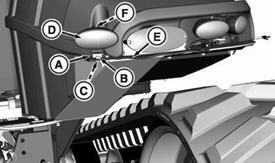 The ball-type drawbar minimizes hitch movement during field operation. The drawbar is equipped with a specially-designed 80-mm (3.1-in.) ball, helping to eliminate any fore-aft movement that creates unwanted jerking customary with a standard hitch pin. The Category 4 ball-type drawbar is approved for transport applications and not approved for draft applications. The ball-type drawbar can be interchanged with a factory drawbar in approximately 20 minutes. 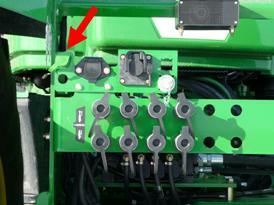 The ball type drawbar is not compatible with 9RT and 9RX Series Tractors. 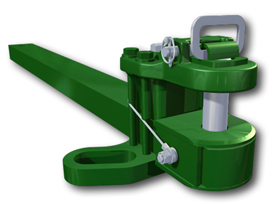 A 3-point hitch with Quik-Coupler is available as a factory- or field-installed option. Electronic draft-sensing relays load information to the electrohydraulic hitch control module for fast, smooth, accurate hitch corrections. Tractors used in deep-ripping applications with hitch-mounted implements and all other applications with high vertical loads on the rear of the tractor are recommended to be equipped with a cast tapered roller bearing gudgeon. 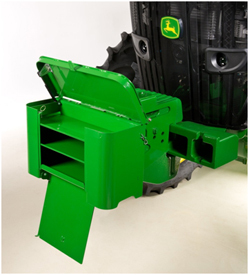 Tractors equipped with dozer blades for silage packing operations are also recommended to be equipped with this option. 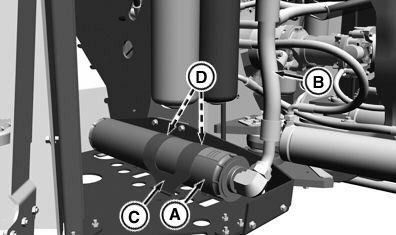 If ordering a 3-point hitch, with standard flow hydraulics, 4, 5, or 6 selective control valves (SCVs) are available. If ordering a 3-point hitch, with high-flow hydraulics, 5 or 6 SCVs are available. 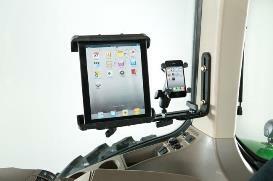 Ergonomically designed hitch command control console makes it easy to operate the hitch. 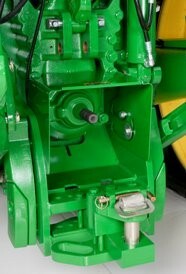 See the hitch controls section for more information. 19-mm (3/4-in.) couplers are available through field-installed attachments with a Hi-Flow hydraulics 435 L/min (115 gpm) system. 18-mm (3/4-in.) couplers are often used where high hydraulic flow is required, typically to run a hydraulic motor. 19-mm (3/4-in.) couplers allow for 45 gpm (170 L/min). A field installed hydraulic accumulator kit is used in applications where implements require large volumes of flowing oil for productivity. Such activities include air seeding, scraper applications or implements with multiple or large hydraulic cylinders. This attachment kit will assist the hydraulic system to maintain adequate hydraulic flow under normal operating conditions. 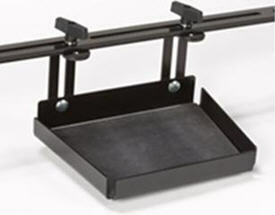 Lift assist wheels are often used with heavy 3-point-hitch-mounted implements. The hitch auxiliary raise kit provides hydraulic power for use with the lift assist wheels. Turning and transport are made easier using this feature. 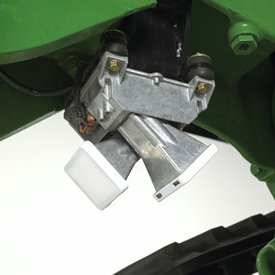 The hydraulic trailer brake kit, available as factory- or field-installed on the 9030 Series Tractors (field-installed available on 9020 Series), will assist in the braking of John Deere tractors and large heavy implements. 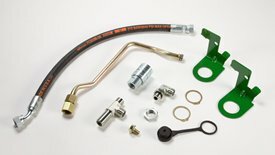 This hydraulic brake kit provides single line connection to hydraulic braking systems. The kit contains the necessary components along with the tractor's hydraulics to operate implements equipped with proper hydraulic brake components. NOTE: Trailer brakes are not compatible on 9120, 9220, and 9230 models. 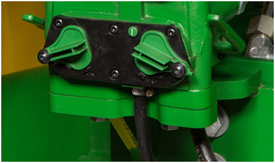 Attaching implement hydraulic hoses to locations on the tractor other than into an SCV has always been a challenge to know what kits are required for compatibility. Getting them installed in a timely manner can at times be confusing and time consuming. 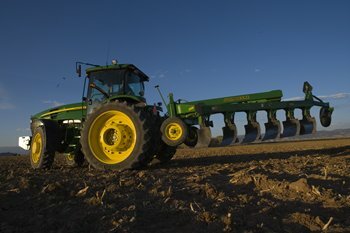 To assist in making hookup to large planters, seeders, and harvesting equipment where multiple connections are required, there are now factory-installed auxiliary hydraulic couplers on wheel tractors. For applications requiring low return oil back pressure (10 psi or less), the sump coupler kit allows oil to return directly to reservoir (differential case) from hydraulic motor, bypassing the remote coupler and SCV. When connecting motor case or seal return hose to coupler, make sure hose end and coupler are clean. 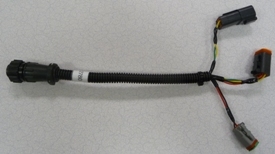 This coupler is required for correct attachment to current-production seeding products with case drain lines. The hydraulic motor return couplers can be used as a coupler for return oil flow, from hydraulic orbital motors and other devices, to the tractor's low-pressure return port, labeled ''R'' on the tractor. 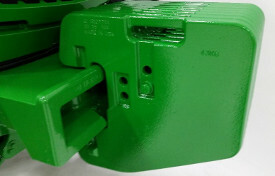 Use of this connector specifically in the return to sump port position is for hydraulic components that require a ''leak-off line'' connection to the tractor. Components and implements that require this typically are larger orbital motors that require a drain for seal protection. 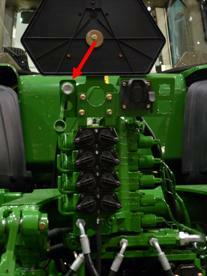 The connector in the sump port is not to be used to carry return flow from a function to the tractor. 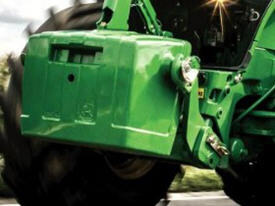 Power beyond provides live hydraulic power to equipment. This kit supplies oil pressure to implements when the engine is running. 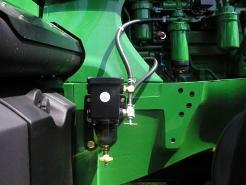 Any implement using power beyond must have a way to control oil flow. Use an independent control valve that is pressure and flow compensating (supplied separately) to control the oil flow rate from this coupler set. NOTE: RE151894 and RE67182 cannot be used together. 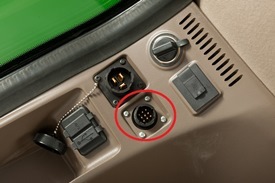 The 9-pin electrical connector is required to allow TouchSet depth control to be used with implements with this feature. 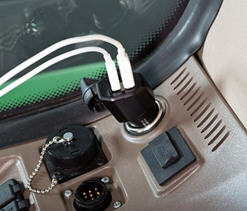 The harness provides a position input to the tractor selective control valve unit enabling the TouchSet system. 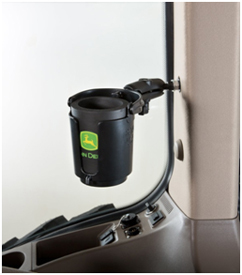 This feature allows the operator to adjust height and depth of remote lift cylinders by using the TouchSet controls in the cab. 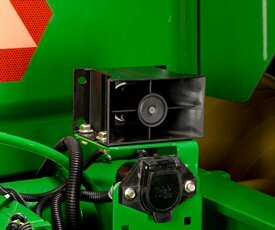 The 9R Series Tractor utilizes an EH PTO-engagement switch to activate the optional 1000-rpm PTO. The following tractor combinations are either recommended or required to install front axle and rear support kits (see chart) based off machine configurations. 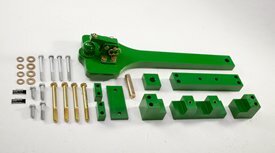 Front frame and axle support kits provide additional support to the front frame and axle joint when the tractor is used in applications that put high torque and high vertical loads on the front end of the machine. This includes front-mounted spray tanks. 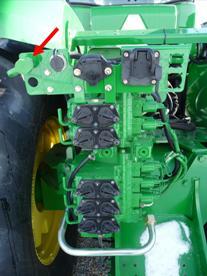 A front frame support kit (BRE10286) is required on all 9RX Series Tractors with front-mounted spray tanks. 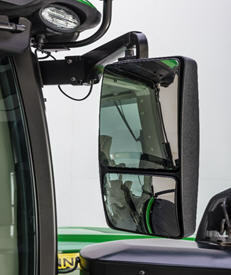 The front frame supports are standard on all 9RX Scraper Tractors. 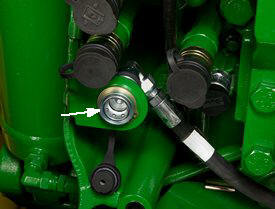 For 9460R-9560R Scraper Tractors, please order RE341567 when using front ballast or front-mounted spray tanks. 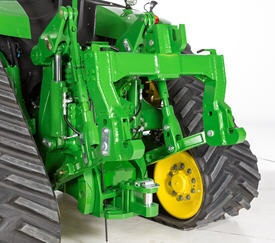 No front support is needed on 9470R-9620R Scraper Tractors. NOTE: All 9000 and 9R Series Tractors require additional front axle and frame support when used with front-mounted dozer blades. 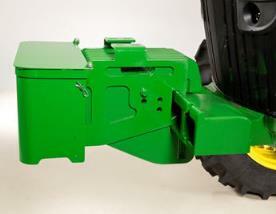 This support is in place of the front axle support and is supplied by the dozer blade manufacturer. Please contact the dozer blade manufacturer for additional information. 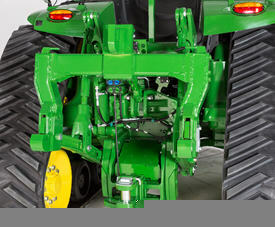 The rear axle support provides additional support to the rear frame and axle joint when the tractor is used in applications that put high torque and high vertical loads on the back end of the machine. 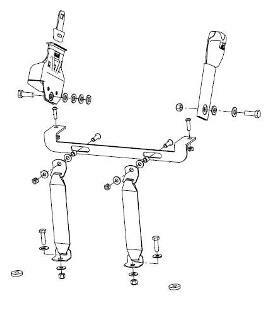 The rear axle support (code 8042) is required when a hitch is ordered on any 9RX Series Tractors; it is optional without a hitch. Rear axle supports are standard on all 9RX Series Scraper Tractors. 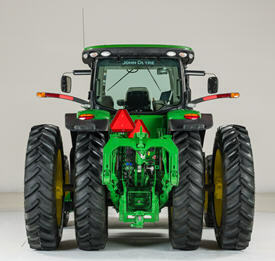 *The rear axle support is not available on 9520R – 9620R Tractors because the double reduction axle design already provides this level of support. The mounting of dozer blades is approved on 9R Series and 9RX Series Tractors. The mounting of dozer blades is not approved on 9RT Series Tractors. 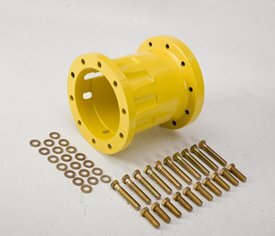 For all 9R Series and 9RX Series Tractors, additional frame supports supplied by the dozer manufacturer are required. 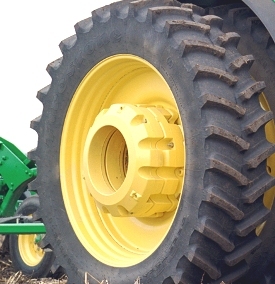 Follow manufacturer guidelines for mounting dozer blade components to the frame of the tractor. NOTE: 9R Series and 9RX Series Tractors are approved for typical agricultural applications, such as packing silage, pushing snow, and non-commercial dirt moving blade work. Front weights provide additional ballast for the front axle. Cast Quik-Tatch suitcase weights (R127764) can be added to provide additional ballast for implements that exert heavy draft loads and require additional ballast or with hitch-mounted implements that require additional ballast to maintain steering control while transporting. These weights are Quik-Tatch weights that require minimal effort to attach. Pick-up weights are design to add fast weight to the tractor. Following pick-up weights can be mounted at the front. 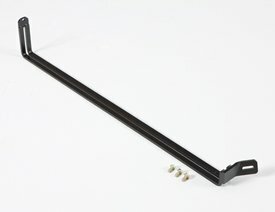 All pick-up hitches can be mounted also at the rear in the 3-point hitch as a counter weight. 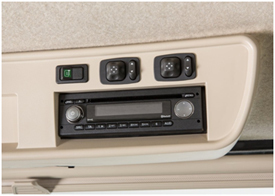 To use the third mounting point, an additional center-link bracket is available. The two weights differ only internally, therefore no external differences are visible. 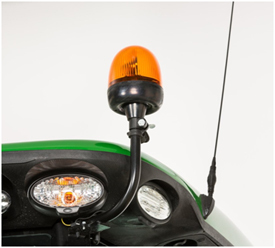 The pick-up weights can either be installed on the rear hitch or on the front hitch of the tractor using the center-link bracket. They cannot be mounted directly on the front base weight. A front hitch is required. 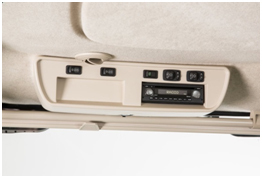 The center-link bracket for installation is included. 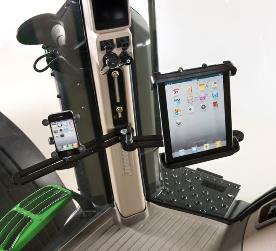 The new shape of the 1500 kg and 1800 kg pick-up weights allows a quick and safe mounting. This is ensured by an optimal alignment of the weight and the tractor along with a self-centering design. Due to the user-friendliness, an optimal ballasting of the tractor is guaranteed at any time. The performance of the tractor is used to a greater extent, which leads to higher productivity and a reduction in fuel consumption. 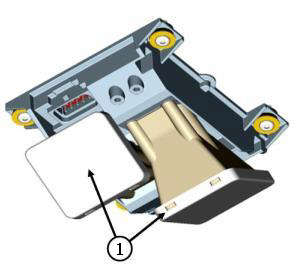 The weights cannot be front installed in combination with Quik-Tatch front weights. NOTE: Ballast should be limited by the lowest of either tire capacity or tractor capacity. The carrying capacity of each tire should not be exceeded. For more ballasting information refer to the operator's manual and ballast calculator. R167153 includes one 75-kg (165-lb) cast starter outer dual-wheel weight used to attach additional 204-kg (450-lb) weights to increase traction on the rear of the tractor by providing additional ballast. These weights can also be used to counterbalance the effect of adding additional weight on the front axle in the form of a front weight support, front hitch, front spray tanks, and front-end loaders. NOTE: Order attaching hardware through Parts. NOTE: Adding cast weight to a steel wheel requires that you start with a 75 kg (165 lb) weight. 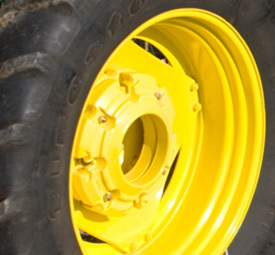 RFR207782 includes two pairs of 204-kg (450-lb) cast rear-wheel weights used to increase traction on the rear of the tractor by providing 816 kg (1800 lb) of additional ballast. Hub extensions mount to the dual/triple hub to extend the steel wheel tread width for exact dual/triple-wheel spacing for 20-in. through 40-in. rows.